SurgiVet’s LDS 3000 Large Animal Anesthesia System was specifically designed to eliminate resistance. 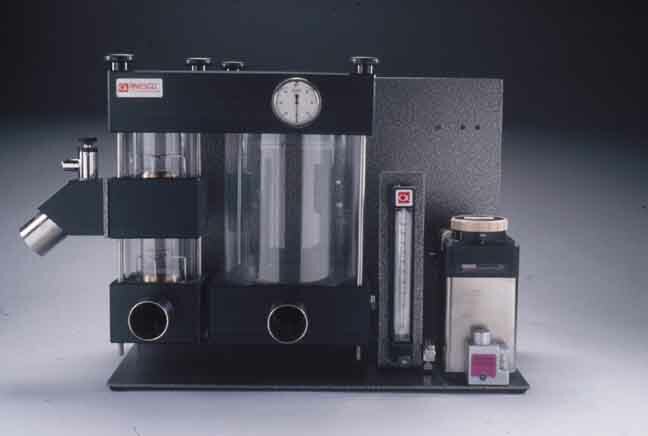 The absorber canister is designed to allow the expired gas to flow evenly and unobstructed through the canister. Because of the port size throughout the circuit, resistance is far less than other machines in the veterinary market. The directional valves are stacked. The Stack-Valve™ design reduces resistance by eliminating directional flow reducing the distance air must travel. Each valve has its own valve leaflet with a cage that allows the disk to lift without any interference. The flush valve activates oxygen flow and permits fresh gas to enter through a separate port at the inspiratory opening, eliminating back pressure on the vaporizer. The close proximity of the fresh gas and the oxygen flush to the inspiratory opening, allows fresh gas to reach the patient more rapidly. The LDS 3000 is designed to be mounted on a cart (as on page 22) or table mounted. Dimensions 22″W x 12″D x 15″H (Machine only).